Relationship World is obviously all about relationships – and this also includes animal relationships of all kinds. 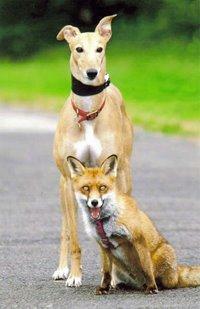 So here is a heartwarming story that was forwarded to me by a friend about an amazing animal relationship. I think it must have done the rounds some time ago. I don’t know the origin of this story but I was so taken with it that I thought you would like to see it too. Geoff relates one of the early incidents. “We had two puppies that had been abandoned by a nearby railway line. One was a Lakeland Terrier cross and another was a Jack Russell Doberman cross. 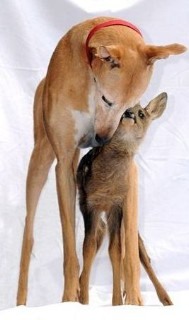 Jasmine, the timid, abused, deserted waif, became the animal sanctuary’s resident surrogate mother, a role for to which she might have been born. 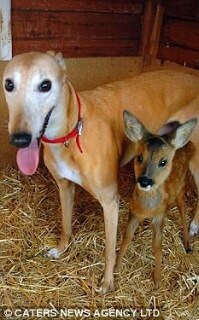 The list of orphaned and abandoned youngsters she has cared for comprises five fox cubs, four badger cubs, fifteen chicks, eight guinea pigs, two stray puppies and fifteen rabbits – and one roe deer fawn. Tiny Bramble, eleven weeks old, was found semi-conscious in a field. Upon arrival at the sanctuary, Jasmine cuddled up to her to keep her warm, and then went into the full foster-mum role. 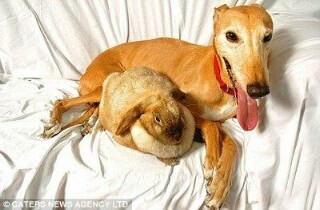 Jasmine the greyhound showers Bramble the roe deer with affection, and makes sure nothing is matted. Jasmine will continue to care for Bramble until she is old enough to be returned to woodland life. When that happens, Jasmine will not be lonely. She will be too busy showering love and affection on the next orphan or victim of abuse. 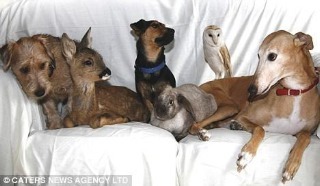 Pictured from the left are: “Toby”, a stray Lakeland dog; “Bramble”, orphaned roe deer; “Buster”, a stray Jack Russell; a dumped rabbit; “Sky”, an injured barn owl; and “Jasmine”, with a mother’s heart doing best what a caring mother would do…and such is the order of God’s Creation. And, just in case you wondered, Snopes.com has verified the truth of this wonderful story and the reality of these photographs which accompany the story – so you can pass this story on, and help to make someone else’s day just a little brighter! This entry was posted in Our Connection with Animals and tagged abandoned animals, animal sanctuary, female greyhound, heartwarming story, Jasmine the greyhound, Our Connection with Animals by Sandra. Bookmark the permalink. I’m glad you like it! We are inclined to forget that we need to consider our relationships with animals too. Thank you, thank you, thank you. What a wonderful, loving story! What a wonderful story – in spite of the hurt and the fear this beautiful animal has more “humanity” than a lot of humans. We all get writer’s block at times but I find that if you really like your subject and have a broad interest in the theme, it helps a lot. For example in this blog I write about many different kinds of relationships – family, nature animals etc. There is always something fascinating and often inspiring to write about in these areas.